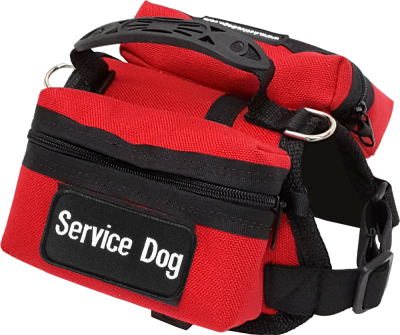 Our Small Service Dog Backpack Vest is designed for the small working dog. Now all those small working dogs have a vest with 2 side bags to carry that little stuff. The vest w/attached side bags is light weight with the least amount of restriction to the dog. The side bags would be handy to carry items such as EpiPen®, pill bottle, wipes, clean-up bags, folding water dish, or paperwork. The side bags have zippers on them so you won’t lose the contents of the bags. The Small Dog Backpack Vest comes with your choice of two 1.5”x3” patches. This vest is lined with Air-Tech mesh fabric so it is comfortable and breathable. Both the chest and girth straps are adjustable. This Small Dog Backpack Vest comes in 4 sizes and all 13 of the vest colors. This vest comes with 2 patches (regular, not specialty patch).